Video games have come a long way since their humble beginnings. The advancement of graphics, sound, and story telling in gaming has come to the point where many games can be considered to be interactive films. Both forms of media employ similar techniques to draw their audiences’ in. (This of course doesn’t apply to every game out there, but many). I’m not just talking about game’s cut scenes either; I’m talking about games themselves. For example, in Twilight Princess when you’re escorting Ilia, Telma and the sick Zora prince to Kakariko Village, its pretty much an interactive chase scene, and a great one at that. Many games also use film’s Mise-en-scène (which is the visual theme, or everything that’s placed in front of the camera that isn’t an actor). When you walk into a house in Ocarina of Time, its not empty, especially Impa’s house, its filled with books and papers and other goodies that give the room its visual theme, and its place in the game’s overall story. Today I’ll be comparing Akira Kursoawa and Shigeru Miyamoto. A director and a developer/designer, and how very similar the two are. For those of you who aren’t aware, Akira Kurosawa was Japan’s most gifted filmmaker of all time. He created some of film’s greatest masterpieces such as Ikaru, Ran, Seven Samurai, Kagemusha, and Yojimbo, just to name a few. Kurosawa was known to be a very hands-on type of person, being very passionate about every single aspect of filmmaking. Kurosawa’s influence in film is still very prominent in the industry today. Shigeru Miyamoto is the most influential game designer and producer who has ever lived. He is the father to some of the best franchises gaming has to offer, Mario, Donkey Kong, Pikmen and of course Zelda. Like Kurosawa, Miyamoto is a very hands-on type of person. So much so that he’s shaken up entire projects to make sure he could get the best quality game out there. Both these men have seen many successful releases of their projects, and both have had a few snags along the wall. Wii Music didn’t do too well for Miyamoto, and Kurosawa’s film Dreams was not as well received by critics. Both men are also very creative when it comes to the presentation of their works, Especially how they deal with the art direction. Skyward Sword’s art style is heavily influenced by Impressionist art, due to Miyamoto’s love for this particular art form. This visual style is also allows the developers to exaggerate many of the enemies appearances. Also, it makes the game quite unique and very beautiful to look at. 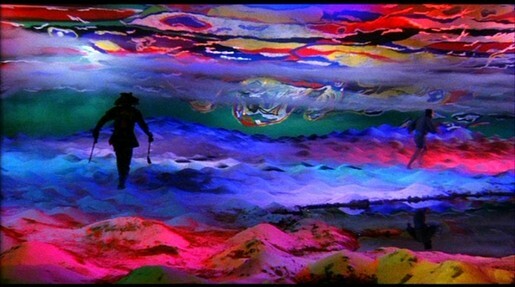 Kurosawa also appreciated the arts, so much in fact, that in Dreams, he did a vignette (titled The Crows) about a painter who was searching for Vincent Van Gogh through his paintings. Below is the Skyward Sword Trailer and Crows for you to compare, and enjoy. As you can see, Miyamoto and Kurosawa are true artists, and masters of their trades. They both use different techniques to keep their works fresh and innovative, and allow their audiences to experience something that is different from the norm. Now, before people start getting up in arms. I’m not saying games and films are the same thing, it’s obvious that they’re different. You’re not going to be sitting in a theater with a controller and changing the outcome of a film any time soon. Games use cinematic elements to help tell the story and move the game along, but many games do have that movie feel to them. Alan Wake specifically comes to mind. Well, I hope some of you found this to your liking, if so, I’ll try to do some more. If any of you are looking into watching a Kurosawa film, I’d strongly recommend starting with Ran , Kagemusha, or Yojimbo and then working your way up from there.